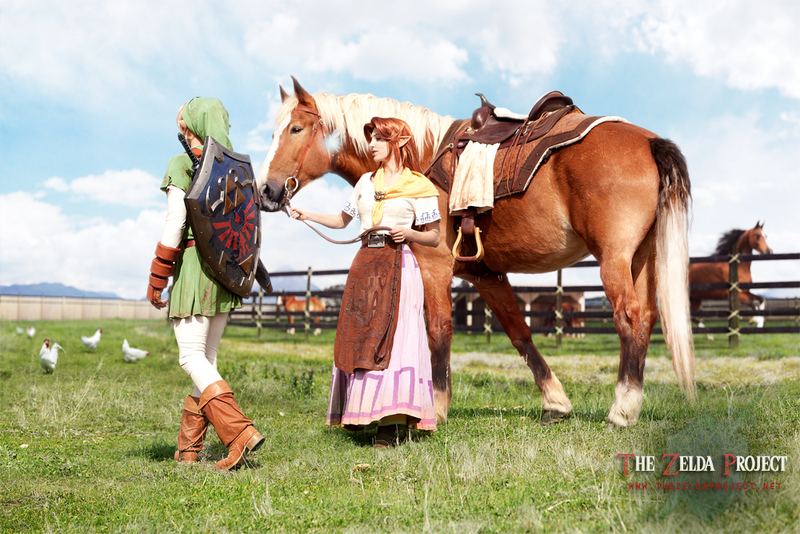 Malon caught the direction of his gaze as she lead Epona out to the pasture. "No Link..." She warned with a smirk, remembering his fondness for harassing the cuccos. They remembered him too, as one of them raised her head to warily observe the hero. The Malon costume is a classic remake of my original Malon costume. The skirt, blouse, and scarf are all 100% linen of varying weaves and thicknesses. The costume has been distressed to show wear and tear, assuming that Malon would get dirty if she was working on the ranch all day! The background is a beautiful digital matte painting by Mickael Forrett. Also, to answer the popular question about horse makeup: We painted Big John's legs and tail and ears to have black on them because his coloration wasn't like that. We used horse show touch-up which many people use in horse shows to hide things like scars and imperfections on their horses. :D Think of it kinda like spray in hair color for humans, but it's made for horses. Oh man. You know you've done it! Everyone's done it! Harassed that group of cuccos at Lon Lon Ranch and then jumped onto Epona's back and rode around in circles while they chase you but can't catch you. So funny. I had to put something like this in because it's too great to pass up.